Hej, jeg hedder [name]. Hi everybody! I’m [name]. 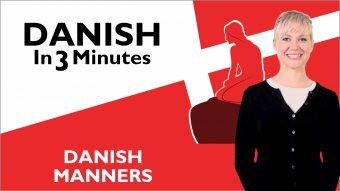 Welcome to DanishClass101.com’s “Dansk på 3 minutter”. The fastest, easiest, and most fun way to learn Danish. In the last lesson, you learned how to introduce yourself in Danish. In this lesson you’ll learn how to use good manners as you thank people. Er I klar? Are you ready? Lad os begynde, so let’s start! When you say “thank you very much”, you just need to add mange at the beginning. During the last lesson we didn’t really mention anything about formality in speech in Danish. However there are some subtle differences in how you will be perceived by others. Tak is the casual way to thank someone, while mange tak expresses more gratitude so is slightly more formal or polite. [slowly] Tusind tak skal du have. But how do you answer these expressions of gratitude? It’s easy! There are basically two different ways to do it! [slowly] Det var så lidt. Literally, this phrase means "It was so little” and is equivalent to “Don’t mention it,” but it is the most common and polite way to respond to someone thanking you. Velbekomme or Det var så lidt. Now it’s time for [name]’s Insights. If you’re not sure about whether to use Tak or Mange tak, keeping it simple is always your safest bet. You don’t have to worry about formal or informal situations; Tak can be used with just about anyone, anywhere, and at any time! Do you know what Vi ses means? In our next lesson you’ll learn this and other greetings in Danish! Tak, og vi ses næste gang! Hello Listeners! How do you say "Thank you" in Danish? Louise says "Er I klar?" "I" is the plural form os "you." Also, in this case, instead using "højre" to say "right," you use "ikke?" or "ikke sandt?" "Højre" is only used as a direction. Glad you liked the video. Hope you will continue to enjoy our Danish lessons.